"A favorite of Minnesotans! The famous Juicy Lucy! Mmmm. So good. You MUST use American cheese on this to achieve the juiciness in the middle! I like sauteed mushrooms and onions on mine!" 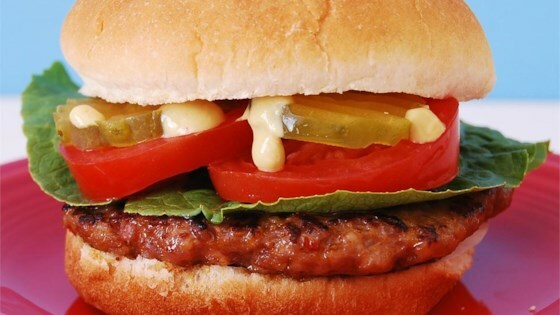 For the juiciest burgers, be sure your ground beef is at least 20% fat. Did you make a tight seal? I hope so, because it needs to be TIGHT to avoid a cheesy eruption as the cheese melts, creates steam, and tries to find its way out. You can also fire up a medium-hot bed of coals and cook these on your backyard grill. Minnesota's contribution to the culinary world! Don't forget to let this gem sit for a few minutes before taking your first bite, or you will have molten lava dribbling down your chin. I have made these before. They are good with Blue Cheese. Try making with your favorite cheese and you will like it. If it is anything like Matt's Famous Juicy Lucy - they will be fabulous! The recipe sounds just like it.